The PRNG1 core implements a cryptographically secure pseudo-random number generator per NIST publication SP800-90. Basic core is small (6,500 gates) and uses an external 256-bit entropy seed to generate 16 bytes (128 bits) of random data at a time (128 bits of security strength). Versions of the core are available supporting higher security strengths (192 and 256 bits), larger amounts of generated bits (up to 219), and different internal datapath widths for size/performance tradeoff. The core includes the AES1 core. The design is fully synchronous and available in both source and netlist form. Test bench uses vectors in plain text format. 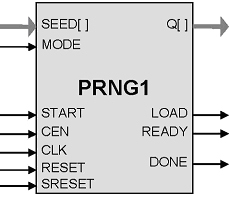 PRNG1 core is supplied as portable Verilog (VHDL version available) thus allowing customers to carry out an internal code review to ensure its security. MODE Input When 0, the START going high will initiate a re-seed. When 1, the START will initiate a generate operation. A Re-seed operation transfers external random seed bits into the core. Some of the seed bits, at least the number equal to security strength, should represent entropy and come from a true random source. A Generate operation produces a predefined number of random bits (up to 219, depending on the configuration). The Generate can be invoked up to 248 times after each re-seed. The core performs pseudorandom generation per CTR_DRBG algorithm as defined by NIST in SP800-90.